Fries might be one of the most basic of side dishes, but they’re ANYTHING but boring. When those wedges of potatoes are made just right, they truly deserve to sit alongside the fanciest of main meals— or to be the star all on their own! These fries are not only coated in a tantalizing mixture of seasoning and cheese, they’re baked, instead of deep-fried, for a slightly-healthier, crispy, golden taste. They couldn’t be simpler or tastier; just watch. Preheat oven to 450 degrees Fahrenheit. In a large bowl, combine the salt, garlic powder, oregano, basil, and olive oil. Mix well. Add the potato wedges to the bowl and toss to coat evenly. Add the Parmesan cheese and toss to coat. Place the coated potato wedges on a sheet pan in a single layer, with skins facing down. Bake for 25 to 35 minutes, until the potatoes are tender and golden brown. Serve with your favorite dipping sauce. Simply delicious. What do you think of them? 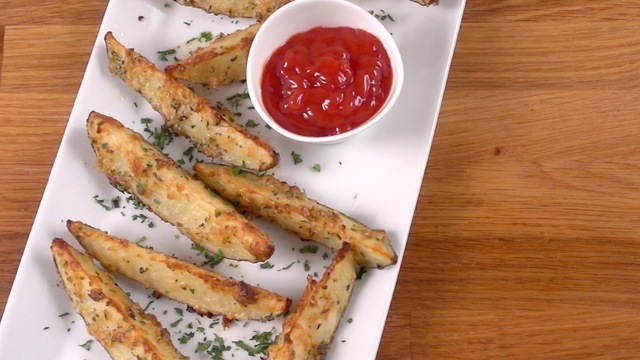 Can you think of any other seasonings you’d like to use on your baked french fries?